What can I say about this outfit? I don't know I don't even like it and I got like 35-40 mosquito bites while I was taking the pictures, and I kept jumping out of the frame. From an outside perspective its actually kind of hilarious because I burst into my house and threw all my stuff on the ground and was screaming for the bug bite goo. I was like a crazy person, got it all over my dress then decided to put more on. Realized there were more bites I missed. I've even got a bite on my FACE! Ah well, I really wanted to show you guys my new dress and talk about how "fall was in the air this morning...blah blah blah" and, "my denim jacket that's as old as the hills." But really, my bug bites remind me that its still summer for awhile longer and I shouldn't write my blog posts in my head before I take the pictures. Oh, and here's my new dress, its shaped like a mullet. Full disclosure: I didn't actually wear the hat to work. People would have looked at me like I was nuts (not that they don't already). hahahaha i've totally had outfit shoots like that. also i really like your mullet dress. also why is your hair so absolutely perfect?? does it curl like that on its own? i LOVE your new header!! and i can relate to bugs ruining an outfit post, although mine were mini horse flies...yuck! What a lovely dress! And your hat is also super cute. I am usually very animal friendly but I just wish mosquitos would be instinct. It would be a better world. How can you not like that outfit? I love it! oh the things we do to get a good outfit picture! haha hope those bites heal soon! LOVELY dress though! i really like it! the whole outfit is just darling! Oh man I think there's even a nasty little bug on your chest in the last photo, it's creating an evil little shadow. You are just stunning. You look like a classic movie star and that is a total compliment. Your dress is so pretty love the print! You are so beautiful! I love the way you paired the denim jacket with a floral dress~ Very pretty! awww you look so lovely in this dress!!! You can't tell you were bit so many times by the photos. That would hurt to have mosquito bites on one's face! ouch! Thanks for stopping by my blog and I'm so happy you did! You are gorgeous and your blog is quite lovely. I feel your pain on the mosquito and bug bites though. I feel like they are attracted to me, bc no matter what if they are around I'm the one getting bite and normally multiple times. On top of that, I'm allergic! Yikes. Hope you have some benadryl! super cute outfit! looks cute and comfortable! the zebra bag is my fav but I am a bit of a handbag aholic. 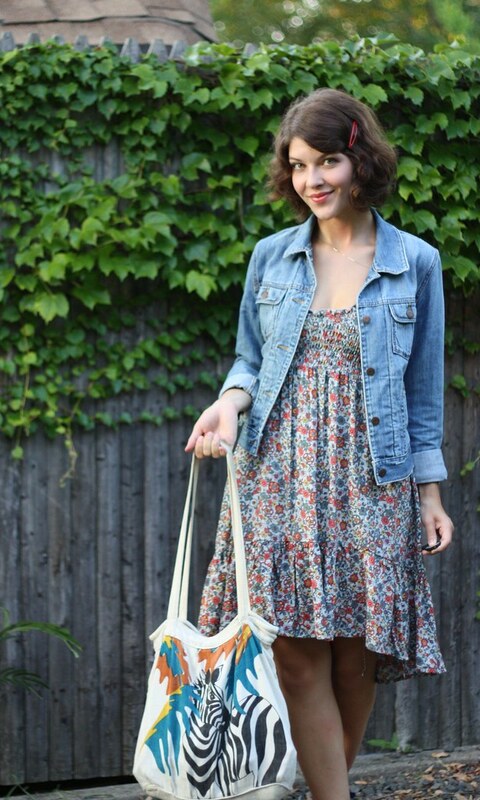 love the floral dress and denim jacket. I love the length of that dress!!! I've been crushing on longer length dresses these days. It's so flattering and pretty! Also, your hair is the bees knees. Oh man, I HATE mosquitoes. You look great even if you think you didn't! this is such a cute oufit!